Birth Tourism - What Does It Mean? What does the term "birth tourism" mean? 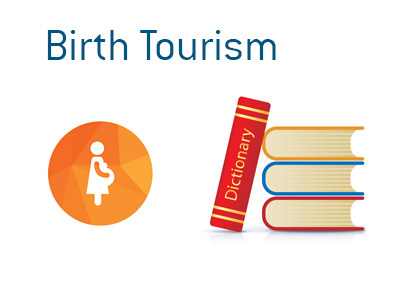 What is the definition of the term "birth tourism"? "Birth tourism" refers to the practice of travelling to another country for the sole purpose of giving birth in that country. Some countries give outright citizenship to any children born in their country. In some cases, the child, upon turning 21, can apply for his parents to become citizens as well. Other reasons for birth tourism include - circumvention of China's one child policy and access to superior health care facilities. A number of countries, including Germany, the United Kingdom and Australia, have altered their citizenship policies in order to help counter the practice of birth tourism. Other countries, including the likes of the United States and Canada, award outright citizenship to children born in their country, which has resulted in birth tourism surging in popularity in both countries. There has been a proliferation of "birth tourism" businesses over the past few years which will coach their clients as to how to deceive border agents as to the purpose of their visits and choose the best facilities at which to give birth.